To DIY this professional floral design place a black and white patterned table runner over white linens (which hopefully is already included by the caterer!) then add various white, black or clear glass vases (6-8 per table) filled with different bunches of white and black flowers! We love how the designers used a single variety in each medium-sized vase and mixed in smaller, bud vases to create this eclectic design where every table centerpiece can be slightly different. While there are are hundreds of white flower varieties to choose from there are less options for black blooms. 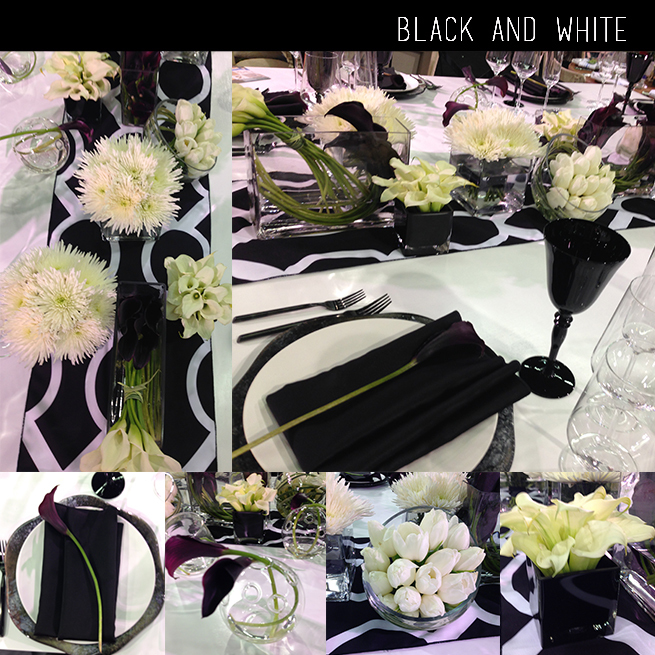 Browse black flowers and white flowers now in our Flowers by Color Gallery to choose varieties and create your own black and white table design. This design was recently shared with Event Pros at The Special Event convention. Special thanks to the designers at Flowers by Cina in Garden Grove, California for sharing this table design. As a DIY Bride myself, I love helping Brides (and Grooms) bring their floral visions to life through the products and inspiration we offer at FiftyFlowers.com! I have worked as the Social Media & Marketing Manager at FiftyFlowers.com for the past 8 years and I love my work in the wedding flower world. In my free time I enjoy spending time with my husband and eating all the gummy bears! Stay up-to-date with flower discounts, DIY trends and news! farm straight to your door!